As the searing desert summer drags on, most of Arizona's Valley of the Sun (Phoenix area) dwellers have had their fill of the heat. By late July or August the heat becomes compounded by "monsoon" season humidity. Then most sane people are looking for some relief. Destinations like Sedona, Flagstaff and the Mogollon Rim with their elevations up to 7,000 feet do indeed provide some relief. But those in the know will head to Arizona's White Mountains to enjoy a real high-country experience while fishing, hiking and camping at 9,000 feet. Only 200 miles from downtown Phoenix, you might need a sweater in the morning; you might enjoy a thunderstorm where it actually rains. From Phoenix, the high country is reached by taking Arizona-87, the Beeline Highway, to Payson, then Arizona-260 east. 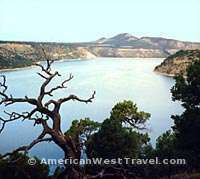 Alternatively, take US-60 out of town to Globe and then up the very scenic Salt River Canyon, which meets Arizona-260 at Show Low. The heart of White Mountain country lies further east. Turn south on Arizona-273, about 30 miles east of McNary. The first attraction is Sunrise Lake, one of the state's top trout fisheries. It is adjacent to Fort Apache Reservation's Sunrise Resort, one of Arizona's top skiing destinations in the winter. The lake offers excellent fishing but can get very windy in the afternoons, as it is treeless. There is a grocery store where boats may be rented. 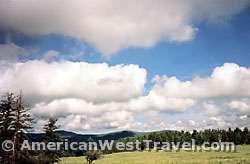 For those looking for cabins or bed and breakfast locales, return to Arizona-260, continue east, and then take Arizona-373 south to the town of Greer where there are numerous opportunities for high country lodging. The three small lakes outside of Greer offer expert anglers good chances for brown trout. Arizona-273 soon becomes unpaved as it drops down to cross the Little Colorado River at Sheep's Crossing. Here you will find the trailhead to Mount Baldy, at 11,590 feet, one of Arizona's tallest mountains. The beautiful trail goes through meadows and dense forest and eventually offers outstanding vistas above timberline. However Baldy Peak itself is considered sacred by the Apaches, and is closed to hikers. A few more miles bring you to the Winn Campground, one of the area's best. Located where woods and meadows meet, you will find large, shaded sites as well as pretty views. As the campground is not adjacent to a fishing hole, there isn't much hustle and bustle. The campground does accept reservations, and they are recommended for summer weekends. Two miles from the camp there is fishing at tiny Lee Valley Reservoir. This lake is perfect for those who like to fish on a float tube. It is stocked unusually, too, with the rare Apache trout, plus Arctic grayling. Continuing south, you eventually arrive at Big Lake, the most famous and productive fishery in Arizona's mountains. Here you will find four campgrounds, a grocery store, a boat launch and boat rentals. Excellent fishing can be had from a boat or from shore. South of Big Lake more high country adventure beckons. Remote Reservation Lake offers great fishing and camping. The rough access road assures plenty of solitude most of the time. Other graded roads continue south to the remote Black River where there are very pretty campgrounds, hiking and fishing. There are no bad choices up here. Wherever you go, you'll find lots of trees, plenty of solitude, and always cool weather. 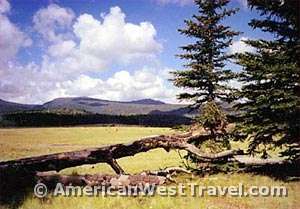 High country destinations can be reached via State-260 east of Show Low, Arizona.